Since I have moved to Boston, the trek home to see my parents in Cordova, Alaska (where I grew up) takes three planes and 18 hours, and a whopping 24 hours to return back to Boston. Therefore, my family and I try to meet up for quality time in various other locales. My father, a retired salmon fisherman and founder of the Prince William Sound Science Center (a center he opened right after the devastating Exxon Valdez oil spill) has always dreamt of hiking in Patagonia, Chile, and last month he finally realized this dream. I accompanied him on this trip for some father-daughter bonding and an experience I will never forget. Cascada Expediciones helped us put together the Patagonia part of our trip (making everything SO much easier, especially since neither one of us speaks Spanish) and arranged a car to take us the five hour drive from Punta Arenas up to the Torres del Paine National Park (they arranged for all of our transportation with lunch stops included at great restaurants). We booked Cascada's 5 Day Torres del Paine W Trek, which includes treks that reach amazing glaciers, lakes, forests and the Paine Towers. We flew into Punta Arenas and spent a worthless two days there (we thought it was going to be a more vibrant city since it is the "gateway" to Chile's Patagonia), as it is an industrial town that has not yet figured out tourism. We had a lunch stop over in Punta Natales, which is a much more active city with adventure tours on every corner, and we wished we had spent our two days here instead. Onto our actual EcoCamp Patagonia portion. 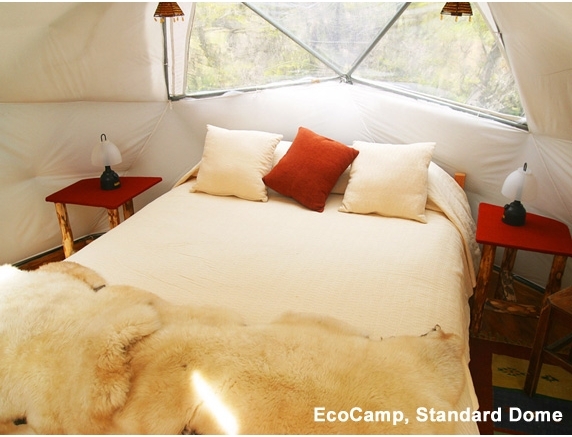 EcoCamp Patagonia is 100% green and comprises standard and suite dome-shaped tents surrounded by the natural beauty of Torres del Paine National Park. This is a much more comfortable accomodation than traditional camping. We stayed in one of the smaller standard domes, which had no electricity, but flashlights, and comfy beds (lots of blankets for the cold nights). The standard domes surround a larger shared bathroom (entirely green, and VERY nice, I was extremely suprised), while the suite domes have their own private bathroom. Suite domes also feature small sitting areas, solar powered electricity and a modern, low-emmission wood burning stove for heating purposes. In addition, there were two much larger adjoined core domes where meals were served each day and they also housed a bar, a communal living room with books and magazines, comfy couches and chairs, a fire place, and huge windows looking out onto the mountains. The trip was all-inclusive except for the bar, but wine was included with dinner. Much more plush than traditional camping! Patagonia Ecocamp was a great base point for all our our hiking treks and we had a great English-speaking guide named Rinaldo. Breakfasts were amazing and fueling for our long days of hiking (7-10 hours a day). Breakfasts included strong coffee, tea, scrambled eggs, toast, cheese, cereals, yogurt, fruit, granola and the like. They also had a lunch bar set up for us so that we could put together and pack our own lunch to bring with us in the mountains. The lunch buffet consisted of sandwich makings (everything from peanut butter and jelly to tuna, chicken and cold cuts), vegetables, hard boiled eggs, fresh and dried fruit, trail mix, granola bars and cookies. They encouraged us to fill our entire bag because you really do need the sugar when hiking all day on the trail. Group dinners (we were sat with our hiking group, eight of us including our guide) were delicious three course events and included appetizers, a local soup, a piece of meat or fish with vegetables, rice and potatoes and a dessert, accompanied by great Chilean wine. Some of the fish was the best my dad and I have ever had (and we are native Alaskans!). All of the food was local and organic, and they were very accomodating for those with dietary restrictions (one of the girls in my group was lactose intolerant and she was offered alternatives for everything the rest of us ate). During our five days of hiking we did the famous Patagonia "W" hike, hiking a W pattern between four points in the Torres del Paine National Park. The trekking was not particularly technical, but it did consist of long, full days of uphill hiking. The views made all of the huffing and puffing worth it, even when caught in the rain (Patagonia has very unpredictable weather), and we were frequently soaked through with both rain and sweat. It was amazing to see how tectonic plates work. You could actually see the layers of granite and stone and where they had collided to create these amazing spires of mountain. At the end of the second day we took a ferry across the lake to another hiking jumping off point and cruised in front of a glacier while they served us whiskey over glacial ice. Hi Alexandra, Love the summary of your trip. Was just wondering why you gave it three stars on Trip Advisor?